The Asia Institute is distinguished by its active research profile. Faculty and graduate research projects involve not only aspects of our four target areas (Arabic and Islamic Studies, China, Indonesia, Japan) but also, and very importantly, Australia's relationship to Asia. A number of projects probe Asia-Australian relations as well as the lives and cultures of Asian migrants to Australia. Other areas of research include computer aided language learning (CALL), endangered languages, dialectology, modern history and various forms of Asian popular culture. A detailed listing of current research projects being undertaken at the Asia Institute is below. Lasting reconciliation with former enemies after a war is a difficult and often distressful process. Peace is not a top-down practice, and the entire civil society must be involved to make it successful. Official apologies have often been perceived as a symbolic yet effective tool to promote peace and reconciliation, and international regimes are often quoted as the optimal structure to consolidate stability. This project untangles the connections between formal apology, regime building and peace in post-war contexts, illustrating the critical role of media and civil society in influencing collective memory and fostering reconciliation. The case studies of Japan, Germany and Italy provide empirical evidence on how media critically shaped the narration of post-Second World War events and how this interpretation is instrumentally linked to the rhetoric on peace and stability. Interviews and archival research are used to elaborate on new cognitive frameworks and paradigms to transform media, and in particular new media, into powerful tools to spread new values and perspectives, embedding civil society in a virtuous reconciliation process. Findings on media-civil society synergies and their capacity to promote new values for the general public will be discussed in workshops, academic journals, policy papers, and a documentary film. The Asian-Australian Public Policy Research Project is an initiative of the Asia Institute. The Research Project's goal is to explore Australia's growing and diversifying Asian-Australian communities, seeking better to understand the experience, status, contribution, and recognition of these communities in Australia, and their role in the development of Australia's relations with diverse Asian countries. A wide range of activities will be delivered, including forums, conferences and publications, that aim to build the research capacity and profile of the Research Project and position it to influence government. The Research Project has received the generous financial support of Mr Jason Yeap OAM as well as the encouragement of prominent community leaders. The inaugural event of the Asian-Australian Public Policy Research Project was a Roundtable organised by the Asia Institute on 28th November, 2013. The purpose of the Roundtable was to discuss Asian-Australians' representation, contribution and recognition in the public sphere in Australia. Invited speakers included three leading academics from other main immigrant-receiving countries of the Pacific Rim: Professor Don Nakanishi of the University of California's Asian American Studies Center, Professor Henry Yu of the University of British Columbia, and Professor Manying Ip of the University of Auckland. Local speakers included Professor Kwong Lee Dow AO, former Vice-Chancellor of the University of Melbourne and current Chair of the Australian Multicultural Foundation, Dr Mukesh Haikerwal AO, former President of the Australian Medical Association and current Chair of the World Medical Association, and Dr Jen Tsen Kwok, Policy and Research Officer with the National Tertiary Education Union, who has recently completed a PhD on Australian Chinese political representatives, their political values and Australian democratic practices. 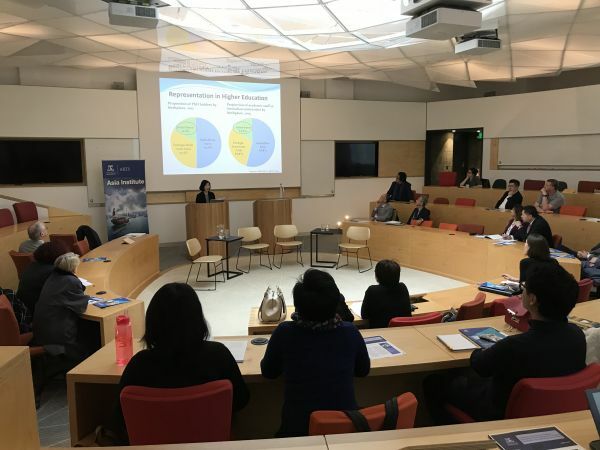 Promoting Asian-Australian Participation in Public Life was a one-day forum organised by the Asia Institute at University House, The University of Melbourne, on Wednesday 5th November 2014. The forum was organised as part of the Asian-Australian Public Policy Project, an initiative launched in 2013 by the Asia Institute in order to understand better Australia's growing and diversifying Asian-Australian communities, explore their experiences, challenges, and contributions to the nation, and promote closer relations between Asia and Australia. The Project has been made possible by the generous support of Mr Jason Yeap OAM, Board Member of Believe - the Campaign for The University of Melbourne. The 2014 Forum built on the success of the Asian-Australian Public Policy Project's inaugural event, a roundtable held on 28th November 2013 to discuss Asian-Australians' representation, contribution and recognition in the public sphere in Australia. The 2014 Forum brought together 14 speakers, including high-profile politicians of Asian ancestry from federal, state and local governments, as well as respected academics, professionals, and community leaders. 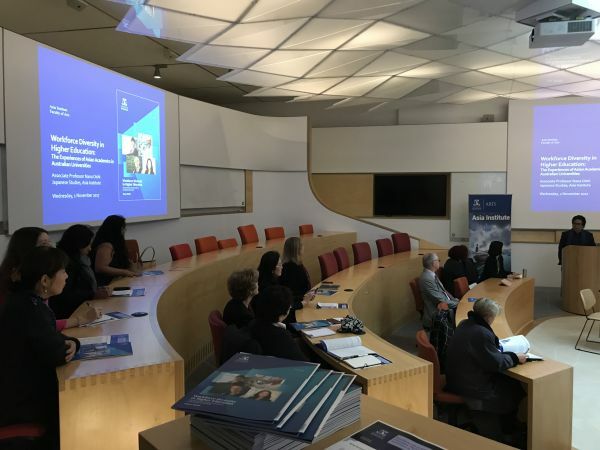 It offered a rare and valuable opportunity to explore the experiences and expertise of Asian-Australian public figures, and to build the knowledge and understanding required to promote Asian-Australian participation in public life. The Forum attracted over 100 participants and drew the attention of the media. The Forum was made up of four main sessions focusing on different topics related to the representation of Asian-Australians in public life. The first session consisted of video speeches recorded by Senator the Hon. Penny Wong and Senator the Hon. Lisa Singh of the Australian Labor Party (ALP), who were unable to attend the Forum due to the state memorial service for former Prime Minister Gough Whitlam, taking place in Sydney on the same day. Professor Pookong Kee, Director of the Asia Institute, delivered a fitting tribute to the former Prime Minister during the Opening Address, highlighting the importance of Whitlam's achievements to the Forum. The Whitlam Government normalised Australia's relations with China in 1972, officially dismantled the White Australia Policy in 1973, and passed the Racial Discrimination Act in 1975, laying the foundations for Australian multiculturalism, arguably the basis upon which ties with Asia have been built. Senator Penny Wong of South Australia, Leader of the Opposition in the Senate and Shadow Minister for Trade and Investment, and Senator Lisa Singh of Tasmania and Shadow Parliamentary Secretary for the Environment, Climate Change and Water, both emphasised the importance of multiculturalism, recognising marginalised groups, and acknowledging the history and contributions made by Asian-Australians, the fruits of which are crucial as the centre of international economic relations shifts from Europe and North America to Asia. They also expressed the hope that Australia-Asia ties would continue to flourish, and spoke of the necessity of increasing Asian representation not only in Australian politics, but in all areas of society, to reflect better the diversity of the Australian community. Their support for the Forum was significant due to their prominent positions in federal politics and their Asian-Australian backgrounds - Wong is the first and only Asian-born cabinet minister, and Singh is the first woman of Indian-Fijian descent to be elected to public office. Senator Wong and Senator Singh's fathers were both international students who studied in Australia, travelling from Malaysia and Fiji respectively. The second session featured a panel of six Asian-Australian candidates for the upcoming Victorian State Election on 29th November 2014, drawn from the Australian Labor Party (ALP), the Liberal Party of Australia, and the Australian Greens Party. Professor Don Nakanishi, a pioneer of Asian-American Studies from the University of California, Los Angeles, opened the session by arguing that like the United States, the number of Asian-Australian politicians does not yet reflect the demographic reality of the country despite an increase in their numbers in recent decades. Moderated by Professor Don Nakanishi and Dr Jen Tsen Kwok, panellists spoke about their motivations for entering politics, the support they had received from ethnic communities, the challenges of the party system, and their experiences with discrimination. Ms Alex Bhathal of the Greens cited the experience of observing her father obtain Australian citizenship as the defining moment that spurred her interest in politics, following the Whitlam Government's abolition of the White Australia Policy. Dr Stanley Chiang of the ALP, was originally a medical doctor and joined politics after witnessing many migrants struggling with language and cultural barriers, resolving to ensure they are able to integrate into and contribute to Australian society. Cambodia-born Mr Hong Lim, current ALP Member for Clarinda, Victorian Parliamentary Secretary for Multicultural Affairs and Asian Engagement, and former Colombo Plan scholar, is the longest serving Asian-Australian in Victorian Parliament. Mr Lim became active in the community and public life when he established a community group to reunite the family members of Southeast Asian migrants. He expressed the point that the discourse on Australia's 'engagement with Asia' has focused too heavily on economic engagement with Australian citizens of Asian heritage often overlooked. Mr Jude Perera, Member for Cranbourne for the ALP and the only Sri Lankan in Australian politics, outlined how his Sri Lankan heritage was considered by some party ranks to discourage votes, yet many people of ethnic backgrounds approached his office believing that he would understand their issues. Ms Harriet Shing, ALP Member of the Legislative Council for Eastern Victoria, has Chinese heritage on her father's side, and became involved in politics through her previous work in industrial relations and workplace relations law, which included equal opportunity and discrimination law aspects. Hong Kong-born Ms Gladys Liu of the Liberal Party, pointed out that Asian-Australians' participation in politics was too low, and that there was a general lack of discussion on how to encourage their participation in public life. It was suggested that promoting Asian-Australians' participation in politics could be achieved through the leadership and example of current Asian-Australian politicians, as well as through recognising and encouraging the role that Asian-Australians play in 'engaging with Asia' through their own personal and business linkages. The third session, moderated by Mr Jason Yeap, centred on fostering Asian-Australian participation in public life, and featured a panel of four highly successful Asian-Australian professionals. Dr John Yu AC was Australian of the Year in 1996, CEO of Westmead Hospital, Chancellor of the University of New South Wales, and is currently Chair of the Centre for Asian Art and Archaeology at the University of Sydney, Ms Cam Nguyen is the founder and CEO of the Australian Vietnamese Women's Association, Mr Chin Tan is the Chairperson of the Victorian Multicultural Commission, and Mr Reynah Tang became the first Asian-Australian President of the Law Institute of Victoria in 2013, and founded the Asian Australian Lawyers Association, in response to the notable lack of cultural and ethnic diversity in legal professions. This session extended on the previous year's discussion of the underrepresentation of Asian-Australians in professional and leadership roles. The panellists shared personal stories and offered words of advice for Asian-Australians and other minority groups to overcome barriers to advancing in their fields, such as developing effective communication skills and a strong contextual understanding of Australia, working hard and maintaining a focus on outcomes, and having exceptional role models. Dr Yu arrived in Australia as a refugee from China during the Second World War. Growing up in Australia, he worked hard to excel as a paediatrician. He also became a visionary hospital administrator. Dr Yu continues to contribute to public life in education and in the arts. Having founded the pivotal Australian Vietnamese Women's Association in Victoria in 1983, Ms Nguyen continues to make a valuable contribution to Australian society as an advocate for Vietnamese women's rights. Malaysia-born Mr Tan pointed out that Asian-Australians were underrepresented in leadership positions, even in sectors where they are typically dominant, and that unconscious bias towards Asian-Australians is still present in many organisations. Mr Tang encouraged Asian-Australians to contribute not only to the success of future generations of Asian-Australians, but also to the wider Australian community in order to eliminate cultural barriers and prejudice. The concluding session was chaired by Dr Sara Wills, Associate Dean (Advancement) of the Faculty of Arts at the University of Melbourne, and Professor Andrew Markus, Pratt Foundation Chair of Jewish Civilisation at Monash University, and Head of the Scanlon Foundation's Mapping Social Cohesion Project. Professor Markus pointed out that despite the steady growth of overseas-born Australians in recent decades, there has been little diversification or increase in the ethnic and cultural makeup of the House of Representatives and the Senate. He also made an interesting distinction between 'appearance' and 'substance' in relation to Asian-Australians' participation in public life, arguing that despite the appearance of members of a certain ethnic background becoming involved in politics, this would not necessarily mean that an ethnic community had any more access to power, and that more research needed to be carried out into the variables affecting Asian-Australians' motivations and participation in politics. 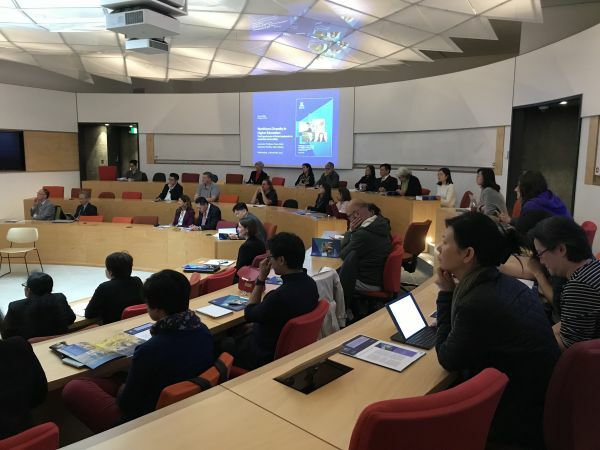 The Promoting Asian-Australian Participation in Public Life Forum was hailed as a great success by participants, and it is hoped that similar forums and events will take place each year as part of the Asian-Australian Public Policy Project. Members of the audience suggested that Asian-Australian participation in other areas of public life, in addition to politics, could be examined. Professor Pookong Kee noted that the Project would progressively focus on Asian-Australian representation in other spheres of public life, including academics at Australia's leading Group of Eight (G8) Universities. Several reports addressing Asian-Australian representation across professions such as government, academia, law, and medicine are planned for the next couple of years. An oral history project has also commenced to record the contributions to public life of leading Asian-Australians, which will educate the broader Australian community on the important role of Asian-Australians in shaping Australian multiculturalism and ties with Asia. The Forum recommended as well the establishment of a task force focusing on Asian-Australian representation in public life and equality of opportunity, and an Asian-Australian White Paper outlining the role that Asian-Australians can and do play in public life, regional integration and knowledge transfer, to complement the 2012 Australia in the Asian Century White Paper. 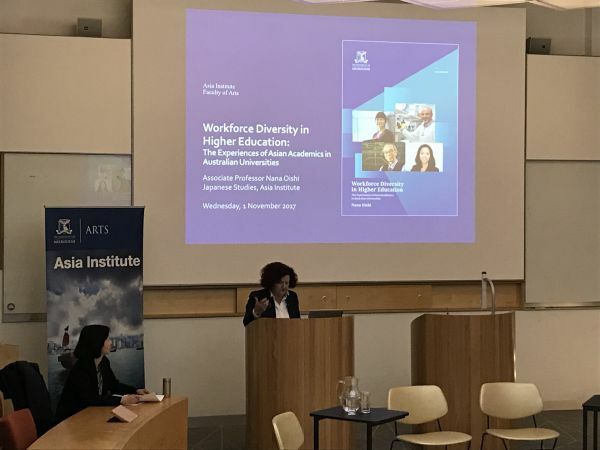 On Wednesday 1 November 2017, the Asia Institute presented the final report of the Asian Australian Public Policy Project, “Workforce Diversity in Higher Education: The Experiences of Asian Academics in Australian Universities”. The report, authored by Associate Professor Nana Oishi, was officially launched by the Provost, Professor Margaret Sheil AO, followed by a panel discussion with Professor Kwong Lee Dow AO (Chair, Australian Multicultural Foundation and former Vice-Chancellor, the University of Melbourne) and Professor Yoshio Sugimoto (Emeritus Professor, Department of Social Inquiry, La Trobe University). The launch was attended by around 60 people, with representatives from both the higher education sector and wider community.